Campaigners have won a High Court battle over plans for a third runway at Heathrow Airport. Councils, residents and green groups had said the government's plan was at odds with climate change targets. Lord Justice Carnwath said the public consultation process used was invalid as it was based on out-of-date figures. The decision does not rule out a third runway but calls for government policy to be reviewed. Prime Minister Gordon Brown said the runway was still needed. The Department for Transport vowed to "robustly defend" the plan. The judge, sitting in London, said the government's public consultation did not take account of the latest information on economic benefits and climate change and was based on figures which were eight years old. The coalition that sought the judicial review into the government's decision, which was made in 2003 and confirmed in January 2009, includes six local authorities, Greenpeace and the Campaign to Protect Rural England (CPRE). 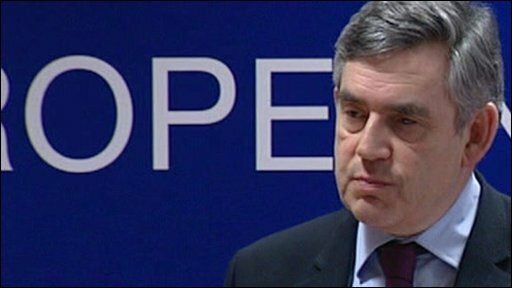 Gordon Brown: New runway is "entirely compatible with our carbon reduction target"
The coalition said in a joint statement that the government's Heathrow policy was "in tatters this morning" after the judge ruled the decision to give the third runway the go ahead was "untenable". The statement said: "If the government wants to pursue its plans for Heathrow expansion it must now go back to square one and reconsider the entire case for the runway." 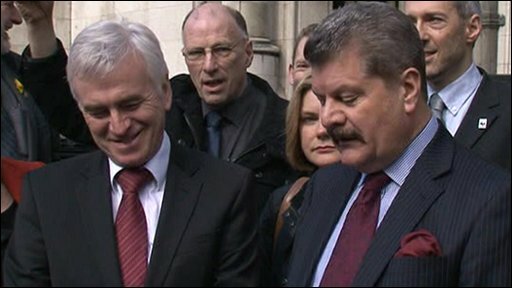 Hayes and Harlington Labour MP John McDonnell, who has led the campaign against the expansion of Heathrow for the past 30 years, said: "This judgment is a victory. "It means that whichever party is in government they will not now be able to force through Heathrow expansion." In his ruling, Lord Justice Carnwath said: "Whether there should be a third runway at Heathrow Airport is a question of national importance and acute political controversy. "It is a matter on which the main parties are currently divided and which may well become a significant debating point at the forthcoming general election." He adjourned the hearing until after Easter to give both sides time to consider what formal orders the court should make. The decision was greeted with jubilation by campaigners. Outside the High Court they waved their copies of the judgement and drank champagne. The judge agreed with them that the consultation carried out by the government into a third runway did not take account of the latest evidence. The decision means that Labour would have to re-evaluate the evidence if it wins the election and still wants to press ahead with a third runway. Campaigners hope that will give Labour the perfect excuse to drop the policy. But Labour says it is still in favour of a third runway adding it was always intending to re-examine the evidence as part of a national policy statement on airports next year. And the judge accepted this argument, saying it did not much matter that the latest evidence had not been taken into account in the consultation, because that would happen in the policy review. So he said he would not quash the government's decision to support a third runway. In the end, both sides are claiming victory. Following the ruling, Transport Secretary Lord Adonis reaffirmed the government's support for expansion, stating that Heathrow Airport was currently operating at "full capacity". He stressed the judgement did not rule out a new runway, but called for a review "of all the relevant policy issues, including the impact of climate change policy". Lord Adonis said: "A new runway at Heathrow will help secure jobs and underpin economic growth as we come out of recession. "It is also entirely compatible with our carbon reduction target, as demonstrated in the recent report by the Committee on Climate Change." Speaking at a press conference in Brussels, the prime minister said: "We are taking seriously both the concerns that people have and the need for public consultation. "But we took a tough decision, the right decision necessary for the future of Britain and the economy, and a new runway will help secure Britain's economic future." Conservative leader David Cameron said the ruling showed the government had made "the wrong judgement". "We said the third runway shouldn't go ahead, we were absolutely clear about that." The coalition against the runway had argued that there was no evidence to support the government's claim that there will be enough public transport to serve it. In approving the third runway, the government had said it could meet the environmental conditions for expansion at Heathrow set out in the 2003 Air Transport White Paper (ATWP), relating to noise, air quality and access. Nigel Pleming QC, for the coalition, said the "economic and environmental" position had fundamentally changed since 2003, which raised the question of whether the government should continue to support the expansion. Lord Justice Carnwath ruled the coalition's submissions "add up, in my view, to a powerful demonstration of the potential significance of developments in climate change policy since the 2003 White Paper". He said they were "clearly matters which will need to be taken into account" under the new national policy statement dealing with airport expansion. While ordering it be reconsidered, the judge refused to quash the government's decision to "confirm policy support" for a third runway, stating that he doubted whether such an order would be appropriate.